It was a Kind of Magic as Roger Taylor of Queen brought the third day of the Wickham Festival to a fantastic finish. The rock legend provided guest vocals for the SAS Band at the end of a rousing set which saw Toyah Willcox, Fish and Madeline Bell perform their own and others’ hits. There was also a guest slot from Bill Oddie who had earlier given an enlightening talk on behalf of the League Against Cruel Sports. But it was Taylor who stole the show with Queen hits It’s a kind of Magic and Radio Gaga as well as a special tribute to David Bowie. 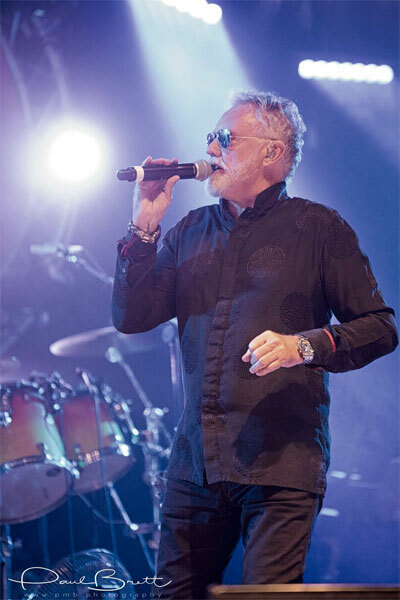 The songs came so thick and fast that there was no time for the planned finale but there was more than enough to delight the 5,000-plus fans who had been treated to a sensational warm-up show. At the end of a chilled afternoon in the hot unbroken sunshine, American country singer Gretchen Peters gave the perfect melodic set. What a voice! It was a true highlight of the whole festival as she played songs from her distinguished 30-year career. Those relaxing in the sun and letting the music wash over them were abruptly roused as Chas & Dave turned up the volume and the atmosphere. There was a right old knees-up in the Big Top as the Cockney duo raced through their hits at breakneck speed hardly allowing the crowd to draw breath. 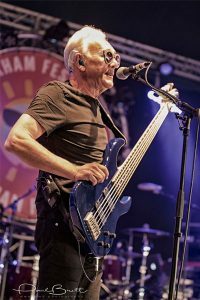 They were followed by the Trevor Horn Band with a special guest slot from X Factor winner Matt Cardle – and what a treat that proved to be! Even the reality show’s greatest cynics could not have failed to be impressed by his amazing voice. His version of I’m Not in Love – accompanied by 10CC’s Lol Creme – was spine-tingling. And his vocals and high energy in the powerhouse finale of Relax had the audience cheering their delight at a great talent who proved an unlikely but hugely welcome addition to the festival which still has one day left to run. And there is a great line-up in store for the Sunday send-off headlined by folk festival favourites Lindisfarne. They are preceded by Hayseed Dixie, the Red Hot Chilli Pipers and Steeleye Span among many others so get down to the picturesque Hampshire site for an unforgettable day in the sunshine. Tickets are on sale on the gate at £60 for the day or £40 after 6pm. Children aged 10-16 are half price and under 10’s are admitted free. There is ample free parking.